Gemix is one of the newer games created by Play n Go and this game is classified as a slot machine, though it is more of an arcade game. With Gemix, the object is to match coloured gems on a 7x7 grid to earn points and payouts. Te game is not played like a slot machine at all and there are no paylines in play. The game is very addictive and the colourful gems will keep players clicking for hours. There is the ability to progress through different worlds, which adds to the addictive aspect of the game. With Gemix, players will enjoy a game that is very similar to the popular Candy Crush game and can have the chance to win real money payouts. The object of the game is to create groups of five or more of the same gems on the screen. These icons can join any way except diagonally. Matching gems will disappear to be replaced by falling gems for more chances to win. With Gemix, there are some bonus features that can be triggered by collecting 20 or more gems in a single spin. There are four different features that are available and these are awarded at random. The Nova Blast will explode a single gem and also destroy adjacent symbols. There is also the Crystal Warp, which will select a symbol at random and all of these will turn into other symbols. 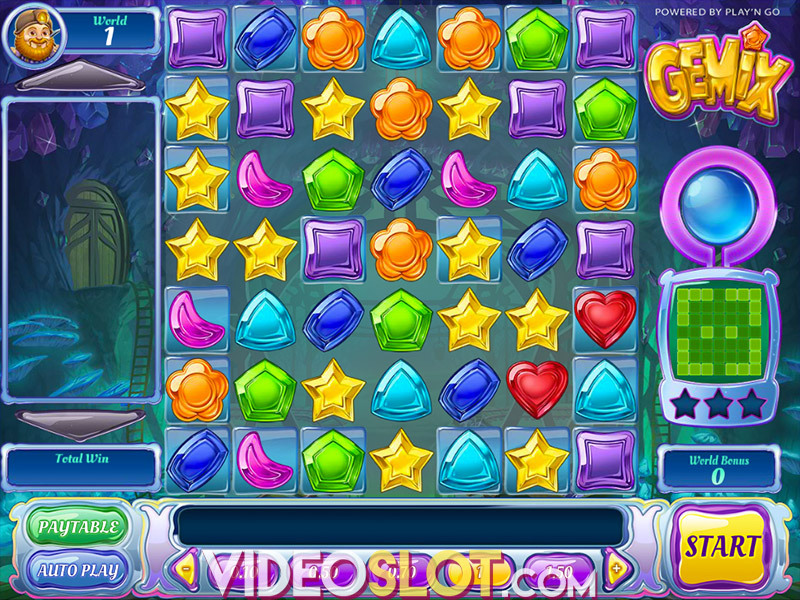 The Light Beam blasts a laser vertically and horizontally and will transform symbols into those that match and the Chain Lightning offers a flash of lightning which will join opposing corners, changing all gems to match in those corners. While playing, if one is able to collect 40 or more gems in a single spin of the game, they will enjoy a 3x multiplier. With Gemix, there are three worlds to progress through and each will offer more ways to win. Each world will have a wild and these can appear at random on any spin. Gemix is a great game for those that are looking for something different than the standard video slot game. While the game is not really a slot, it can produce some great payouts and players will find the game very enjoyable and highly profitable.